Anti-austerity, pro Keynesian economic policy has now officially moved beyond the mainstream financial news and become the headline story on comedy central. A paper was recently released showing that Reinhart & Rogoff made a mistake on their study of how debt to GDP ratios impacted growth because they left off 3 countries during the study. Before we watch the video below, which is fun, and you begin reading or watching the mainstream news which all back Keynesian (increased government debt) growth, let's take a quick walk through the land of common sense. 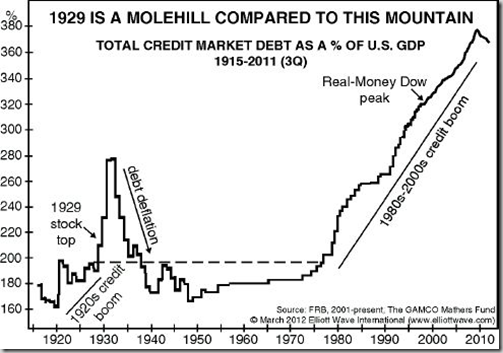 I am in complete agreement that an increase in government debt in today's modern financial world will increase growth in the short term. It provides a boost to the economy the way a steroid shot boosts an athlete or a heroine shot boosts a junkie. 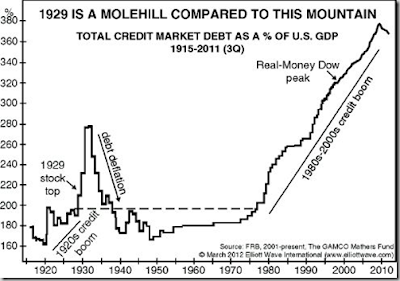 When you live in a world where growth has been manufactured through an increase in credit levels it is simple math to understand what happens if you take that credit away. The problem with today's modern debt markets is that there is no pricing mechanism to alarm participants when they are entering danger. This is because the central banks around the world are artificially holding interest rates down with their QE purchases. If they were to release that artificial push downward, no one has any idea where the free market rate levels would rise to. Imagine you have taken a shot that numbs pain completely all over your body. You walk into the kitchen to cook dinner and your shirt catches on fire and begins to burn your arm badly, but you cannot feel it. The fire now has the ability to spread to the rest of your body, which you will not notice until you can actually see it, which at that point will probably be too late. Modern economists would look a this situation and say, "don't worry, they can't feel the pain so there is no problem." A rational human being would say, "what happens when the numbing medication wears off?" This is exactly what is taking place in the bond market today. The governments can hurt (burn) their balance sheets as much as they possibly want to. There is no mechanism in place to notify anyone of potential danger because central banks are masking it with their numbing medicine. In today's modern world an increase in government spending backed by the numbing medicine of QE is the most perfect elixir for growth. An economy grows and grows, steadily and slowly for years, and then all the sudden it stops. Now, here is where it gets interesting. When the music stops it will not be a slow and steady fall downward. You will not have time to casually sell positions or make adjustments. It will be a complete collapse. It will be like looking down and seeing your entire shirt on fire. Almost everyone I know and interact with on a daily basis would tell me that if their next door neighbor financed their lifestyle through credit cards and they paid those credit cards by printing money in their basement that their could be a potential danger to their way of life if either one of those tools for "growth" was taken away (credit cards or the printing press). Yet, many of those same people see little concern with the way our current government spending and printing economic model is structured today. What if one of the tools for "growth" was taken away? The first response would be that they would never need to be taken away. Really? Then why have we not been running trillion dollar deficits financed with trillion dollar QE programs for decades? 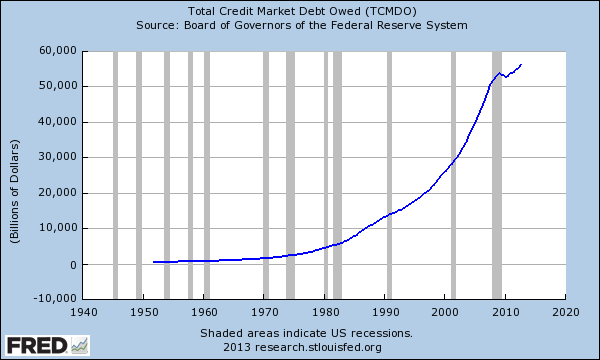 Why do we not just run a $5 trillion deficit this year with $5 trillion in QE? Would that not just create more growth? 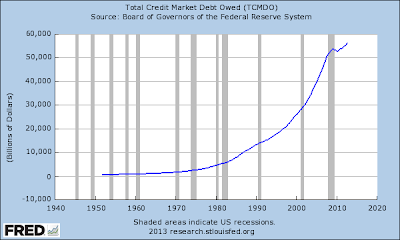 Every week you will read on this site about about how trillion dollar deficits combined with trillion dollar QE programs do not provide long term sustainable growth. Every week it will appear on the surface that this analysis is incorrect because the financial markets will show that they feel no pain, no burning. Many businesses or investments (see real estate) that depend on artificially low interest rates or an artificially strong currency will appear as if they feel no pain. Then one day we will wake up and those that have studied Austrian economics, or even better; those that can just look at a situation and use common sense, will understand why the world is a very different place. Many people woke up the day of the Lehman Brothers bankruptcy and understood exactly why the financial system collapsed. It had nothing to do with decisions made the night before, it had to do with the decisions made every day over the previous decade. I do not look forward to this day, and I'm sure that those that understand economics do not either. I certainly do not look forward to the suffering that the people of Japan will soon experience, but what I want to happen makes little difference on what will happen in reality.